Stockholm’s Castle was rebuilt in the early 1700’s after a devastating fire destroyed the original. 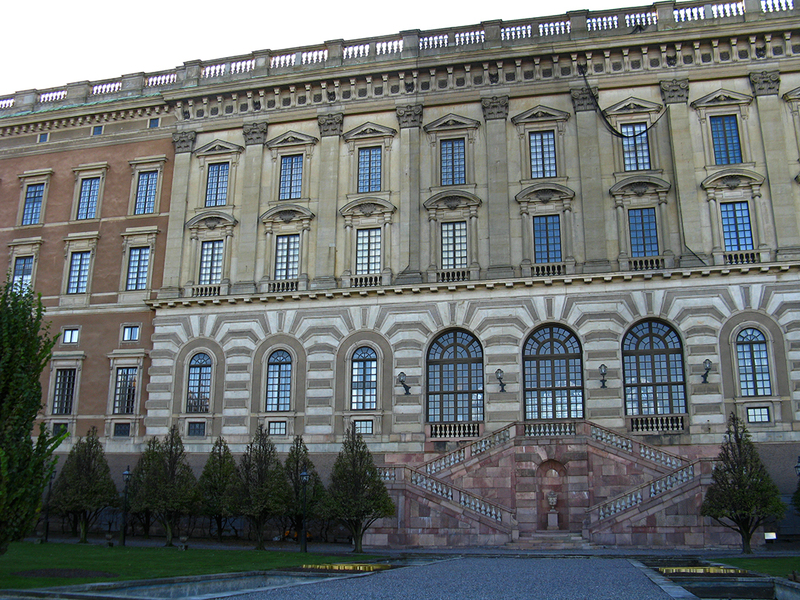 To me it isn’t the palace itself, as imposing and beautiful as it is, that was the important dimension of the project; instead, it was how the castle fit into a new urban plan which completely re-configured part of Gamla Stan, all of Helgandsholmen, and part of Norrmalm. The original castle, called Tre Kronor or Three Crowns, was an amalgamation of parts and pieces that had been built, renovated, and added-on since the 1250’s. Its waterfront location, high walls, jumble of towers, turrets, and Renaissance gables lent the Three Crowns Castle a fairytale-like air whose spirit embodies today’s (Disneyland) concept of “medieval castle.” In comparison to the defensive castle as seen in the 1661 painting below, the building that stands in its place is a placid palace. While it has a quiet, simple character, it is not short on grandeur: the new palace has 1,430 rooms and is Europe’s largest royal residential palace (to give an idea of the palace’s scale, the interior courtyard is football-field length). 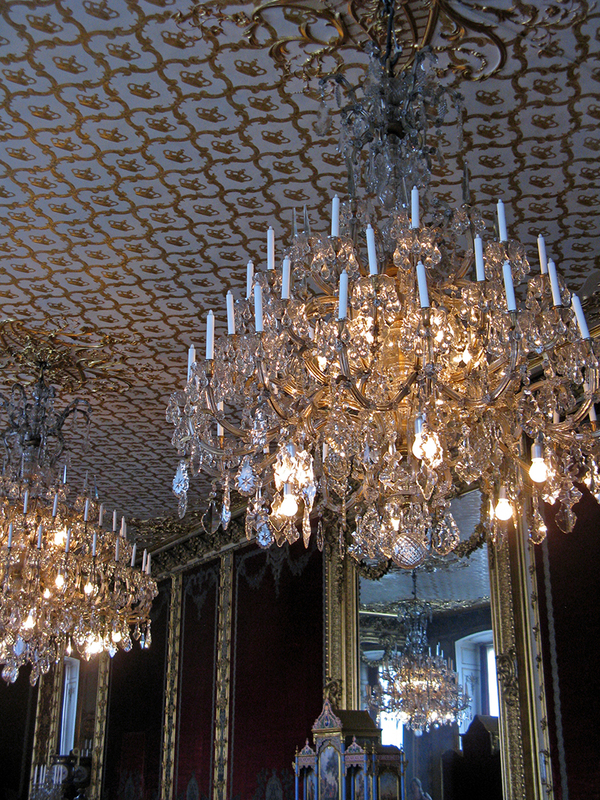 Like Stockholm’s lesser palaces, Three Crowns had a long history of renovations. In the late 1500’s, modern Sweden’s first king hired Willem Boy to transform the palace from a medieval fortress to a Renaissance castle. While the facades and turrets were updated in style, the defensive nature of the castle remained; the Stockholm Bloodbath in which 50 of Sweden’s highest ranking noblemen had been killed by the Danes was only about 50 years before and was still fresh in King Vasa’s memory. A model at the palace shows the castle after Boy's renovation. The jumble of the original castle's many additions and alterations over time is apparent. In the 1650’s, Jean de la Vallée proposed a remodel of the castle that would keep the central medieval tower while it regularized and re-clad the surrounding buildings in a colossal and overtly classical façade. In Jean de la Vallée’s proposal, the castle was reoriented to face north toward Norrmalm and a corresponding bridge over the water from Gamla Stan, past Helgandsholmen, and to Norrmalm was included in the project. 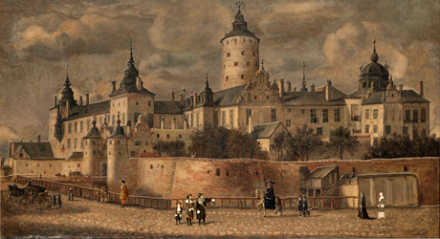 Additionally, other than the central tower, Vallée’s proposal removed any defensive character from the building; he transformed the castle into a palace (at this later point in history Stockholm relied on a defensive network of castles and fortifications out in the archipelago to stop any attacks before they got to the city). Although Vallée’s scheme was never carried out, it did set a precedent which future proposals would remember. Just a few years later, in 1666, Nicodemus Tessin the Elder designed a new veneer for the northern façade of the castle. 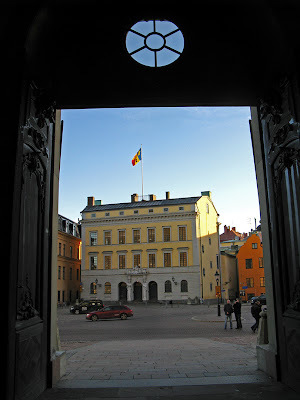 This was contemporaneous with the renovation of many older palaces in Stockholm; like the other palaces, the Three Crown castle “modernized” from a detail-rich Dutch Renaissance to a restrained classical style (see my post: Palaces from The Time of Great Powerin the 1600's). Nicodemus Tessin the Younger carried out his father’s drawings, and the new northern façade was finished in 1692 (map 1). Shortly thereafter, in 1697, a huge fire devastated most of the castle, burning everything but Tessin’s newly renovated wing to the ground. The survival of Tessin’s wing coupled by the fact that Nicodemus Tessin the Younger generated full and detailed plans, sections, and elevations for the castle’s 1,430 room replacement within six weeks of the fire makes me a bit suspicious as to the cause of the blaze. In all my reading, I have not come across anything that assigns or even hints at blame to Tessin, but it’s hard to imagine a better way for the royally appointed architect to create job security for himself. 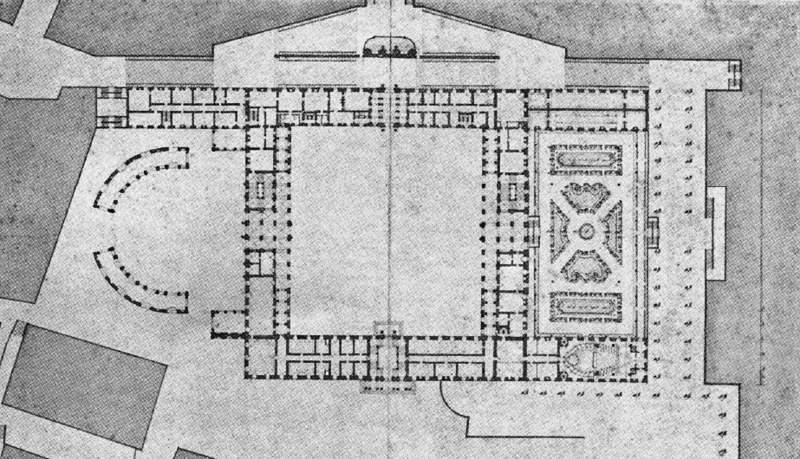 In stark contrast to the original castle’s assemblage of parts over time, the new palace is an orderly, nearly symmetrical plan consisting of a central square surrounding a courtyard plus three wings pointing to the east and west of the square (there would have been four wings but the existing church was in the way of the southwest wing). There are an additional two wings forming a broken arc at the west end of the building. The symmetrical nature of the new palace is important in addressing the palace’s many “front” doors: one facing Norrmalm to the north, the growing commercial center of the city; one facing Gamla Stan to the south, the traditional heart of the city; and one facing the water to the east, the city’s entry point and diplomatic façade. The western façade faced the rounded wings which housed the castle guard and army commander. Just as the various facades faced various aspects of the city, their design and functions echoed what they faced. 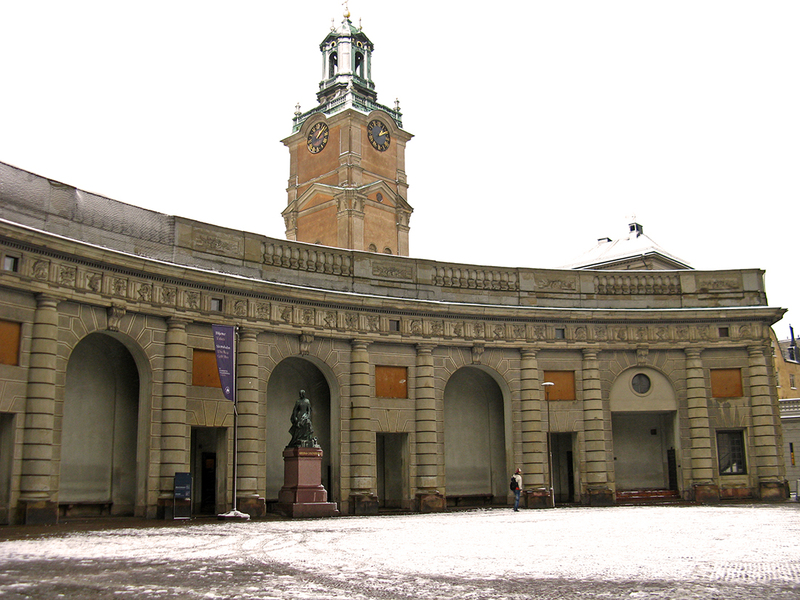 The northern façade facing out to the city at large houses the Rikssalen, or the National Hall, which housed the King’s throne room. The south façade (map 2) faces historic Gamla Stan and the city’s historic cathedral church; this wing houses the castle chapel and the façade decorations commemorate the nation. The palaces South facade. Statues and panels represent important contributors to Swedish society like Linneus who was an admired botanist throughout the world. 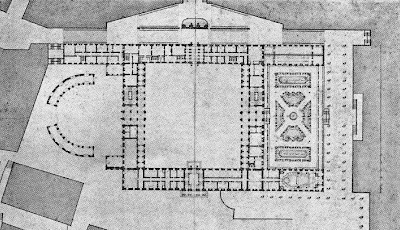 The eastern façade (map 3) facing the water is the Queen’s side; the “feminine” qualities of this entrance through a small but formal garden were meant to be welcoming and disarming for arriving diplomats. The western façade (map 4) facing the arched wings housing the castle guard is the King’s side and is decorated in war and “manly” themes. War themes on the western facade: a helmet, three war ships, arrows, a horn to signal "charge! ", a dagger, and a crossbow with a sheath of arrows. It is interesting to note the difference in quality between Nicodemus Tessin the Elder’s north façade and Tessin the Youngers’ façades. The slightly older, north façade is much simpler in comparison to the other façades. The older north façade is nearly decoration-free except at the portal, but the slightly newer facades feature patterned plaster work, pilasters, ornate window surrounds, varied window shapes, complicated cornices, Juliette balconies, niches with statuary, patterned floor bands, textured plaster, medallions, caryatids, and Italianate arches. The return to Classicism after the Dutch Renaissance style was at first a simpler, cleaner architecture, but it didn’t take long for the “new” Classicism to become quite decorative and additive. The plan and design of the palace itself is fairly straightforward, but the re-configuration of the urban environs around the castle are more complex and require a short history lesson for better comprehension. First, it is important to note that the fall of the “great” Swedish empire corresponds to the end of the 17th century. In 1700, Russia, Saxony–Poland, and Denmark–Norway joined forces and attacked the Swedish empire on all sides. King Karl XII was initially able to defend the country’s territories in unexpected victories, but he became too cocky and committed the classic mistake of trying to attack Moscow. At the Battle of Poltava, the Russians captured most of the Swedish army, and King Karl XII was forced to flee to the Ottoman Empire where he stayed for years trying to convince the Ottomans to join in with Sweden to attack Russia. The Ottomans were only so interested in Karl’s plan and they eventually became fed up with Karl’s political intrigues and his soldiers’ terrible behavior; King Karl XII was eventually imprisoned by the Ottomans for several years. By the time Karl returned to Sweden in 1714, Russia had become the great power in the North, and Sweden’s war-weary Parliament converted the crown from an absolute to a constitutional monarchy. Given this war-beleaguered background in which Sweden lost most of its empire, it is no wonder that the king didn’t have money to rebuild right away and that the new palace wasn’t habitable until 1754. It is also no wonder that Tessin’s new urban plan for the areas around the palace created a triumphal urban center which through blatant symbolism and grand, processional spaces declared Stockholm the seat of a grand and successful empire. Naturally, these references to grandeur and success were merely illusions; Tessin sent his urban plans to King Karl XII for approval while the king was imprisoned in Constantinople and dreaming of a re-built Sweden. Tessin’s new urban plan was never carried out—not only did the king not have enough capital to realize the plan, but he died four years after returning to Sweden and subsequent monarchs did not have the same egotistical need to assert their prowess. Despite not being built out, the plan remained important for Stockholm’s future urban design and as a record of how an 18th century absolute monarch wished to immortalize himself. The fundamental heart of Tessin’s plan was an axis between the royal palace and a newly built burial church (map 5). This axis is formed by a straightened bridge across Helgandsholmen to Norrmalm (recalling Vallée’s earlier proposal). Like the palace interior where the chapel and the throne room face each other across the interior courtyard, Sweden’s important axes of monarchy and religion were symbolized in Tessin’s plan where the new church and the royal palace faced each other across the water. The other parts of the plan—the palace hill and rearrangement of Gamla Stan, the stable on Helgandsholmen, and the formal square on Norrmalm were all secondary elements to this new ceremonial axis. On Gamla Stan in the vicinity of the palace, Tessin had to deal with a sudden change in grade of about 30 feet between the water’s edge and the palace’s southern portal. Because the palace was no longer a castle with walls, ordinary people and goods needed to be able to negotiate this terrain, but it was critical that the area outside the palace’s southern entry be flat for ceremonial purposes. In order to accommodate both needs, Tessin designed a very steep slope (map 6) ramping up from the water’s edge to the southern portal. However, because several existing buildings at water level on the south side of the palace hill would be obliterated by this ramp, the southern edge of the ramp is a wall that drops into an ditch-like alley which allows access to the original buildings. 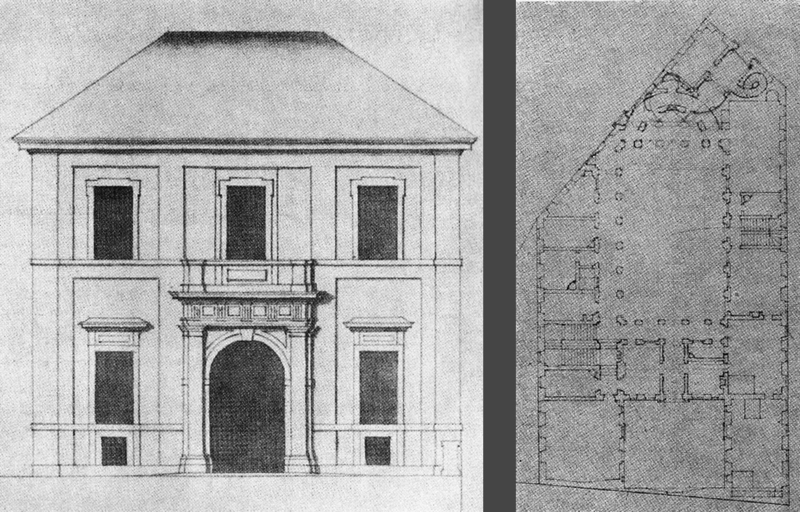 (These original buildings include Flemingska Palace #11 and Boneaus Palace #19, Palaces from the 1600’s.) This is a bit of an awkward design move that is still confusing and misleading today. Tessin's awkward elevation change solution with existing palaces and the resulting ditch to the left, the grand ramp leading to the backside of the church in the middle, and the royal palace on the right. The ramp is much steeper than it appears in this photo. It is also anticlimactic that this imperial, ceremonial ramp is directly on axis from the water to the back side of the cathedral church (map 7), which was also in existence long before Tessin’s time. Tessin hoped to partly alleviate this problem by re-cladding the medieval Gothic church in a classical baroque façade that matched the style of the palace. The new facade looks more like a front door than the backside of a church and leads to confusion. Tessin's drawing for the re-cladding of the church. Today's church is a bit simpler than Tessin's drawing. a stock market (map 9), and a machine house (map 10) (not sure exactly what this entailed). Not liking the medieval town hall (map 11) facing Gamla Stan’s Stortorget (“The Large Square,” the heart of Gamla Stan), Tessin also proposed to rebuild it in a classical style more in keeping with the times. Directly west of the palace beyond the curved guard wings, Tessin designed a building to house Sweden’s Supreme Court (map 15). 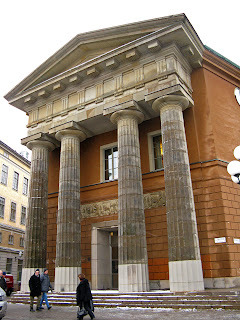 And not to leave any important aspects of Swedish society or government out, he also designed a mint building (map 12) a block away. The mint building was not built until the 1780's, and it does not appear to have been much influenced by Tessin's design (I'm not sure who the architect was). As far as I can tell, Tessin’s own palace was the only one of these six buildings that was ever realized. The mint building as built in the 1780's. At first glance, it’s hard to understand why such a prominent place and so much real estate would be devoted to the royal stables, but considering the increasing importance of cavalry in war and the king’s loss of much of the Swedish empire, it makes a bit more sense that the stables and carriage house would occupy all of Helgandsholmen (“The Holy Spirit’s Island). The original stable had been designed by Tessin’s father, but it burned in 1696, allowing Tessin to build a showier, grander version which also included a show track and grandstand that would provide entertainment. 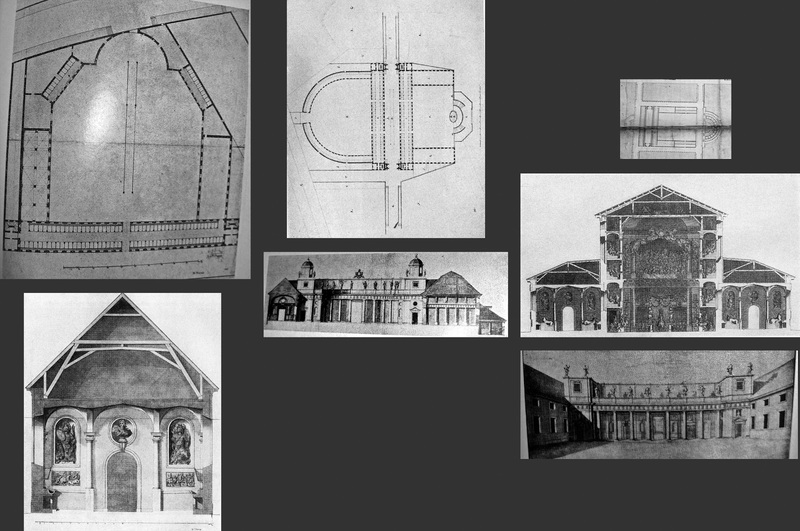 For me the most interesting aspect of the stable buildings is that we have a slew of Tessin’s drawings for the project as he reworked and refined it. You can see the progress he made from the first submission to the last. 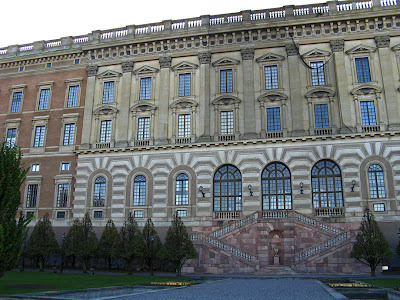 Again, however, this project was not realized and the island is now home to Sweden’s Parliament. Tessin's drawings for the stall buildings from 1696, 1712, and 1713. 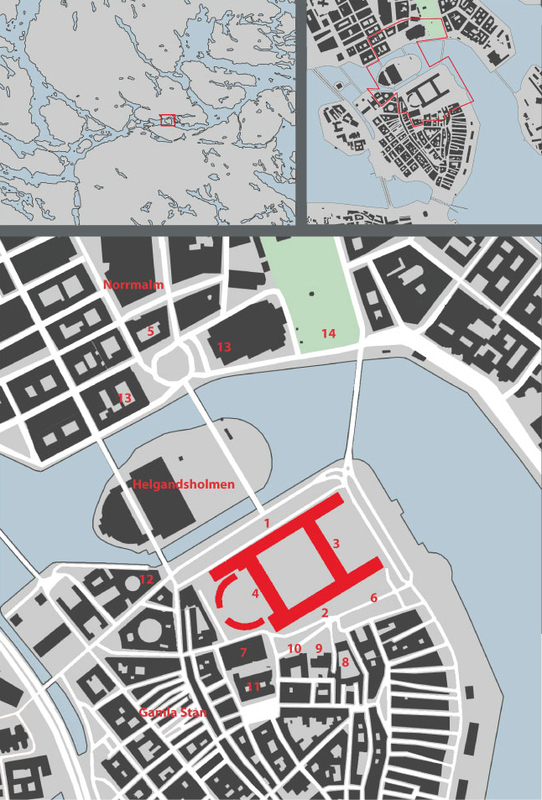 Tessin’s proposed changes on Norrmalm are perhaps the most striking part of his urban plan. 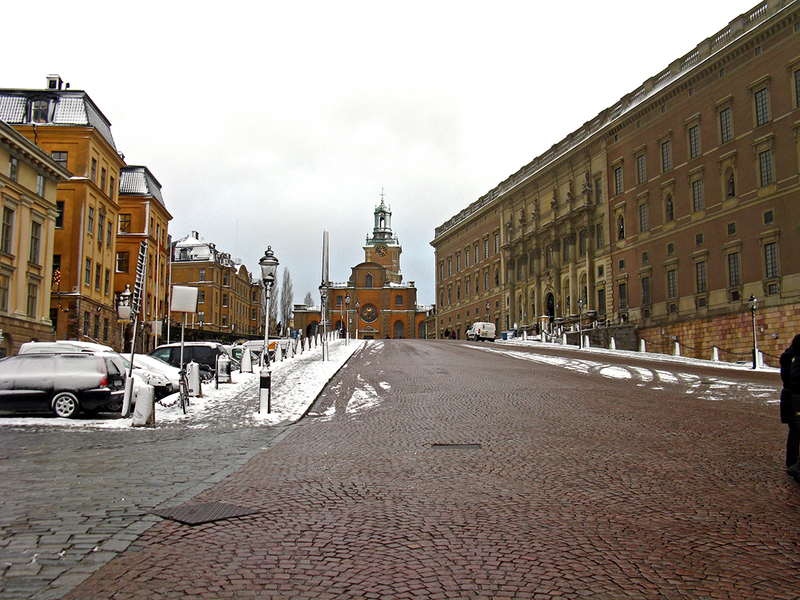 When walking from the palace to Norrmalm over the straightened, axial bridge, a person would be walking directly toward an imposing church (map 5). Tessin proposed this church as the new burial church for the Swedish monarchs (I supposed the existing burial church on Riddarholmen was too old-fashioned for him). It is no accident that this church strongly resembles St. Peter’s in Rome. On a study trip to Italy several years before, Tessin had fallen in love with Michelangelo’s, Bernini’s, and Palladio’s architecture. References to giant, powerful empires (be they papal or Roman) were just another way to shore up the king’s fallen ego. It is also no accident that the church’s cupola and the top, residential floor of the palace were at the same height—the king and god were equally above all others in Sweden. Tessin imagined the square in front of the new church to be much like Rome’s forum: a place for all to cross paths while being reminded of who is in charge. Proportional relationships were important to Tessin’s designs, and he designed the square to have a 3:2 relationship, the ideal relationship for a city square according to Vitruvius. 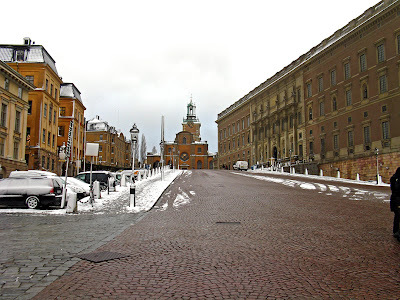 Flanking the church, the two private palaces (one of which was Torstensonska Palace, #5 in my Palaces of the1600’s post) (map 13) were to be removed and classical public buildings were to take their place in order to house Stockholm’s governor and the palace office. Various monuments and fountains were planned for the square. While none of the buildings around this square were ever realized, they did inform the public, monumental nature of today’s Gustav Adolf’s Square. 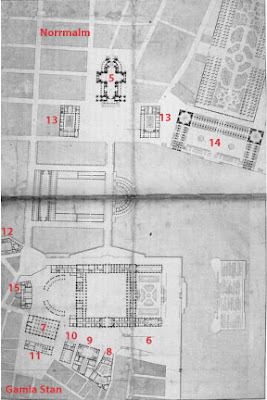 Tessin's perspective of the church square, a monument to be placed in that square, and a plan for the replacement of the palaces that flank the square. 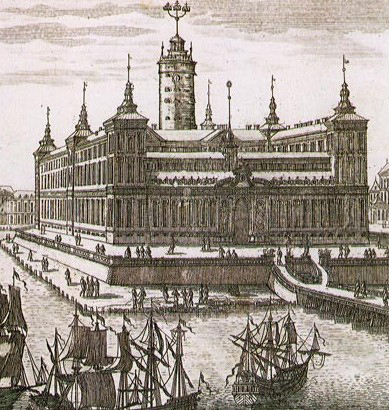 The perspective gives a good idea of what those palaces would have looked like in elevation. The monument to the king implies that he is more powerful than the Egyptian empire and Hannibal. 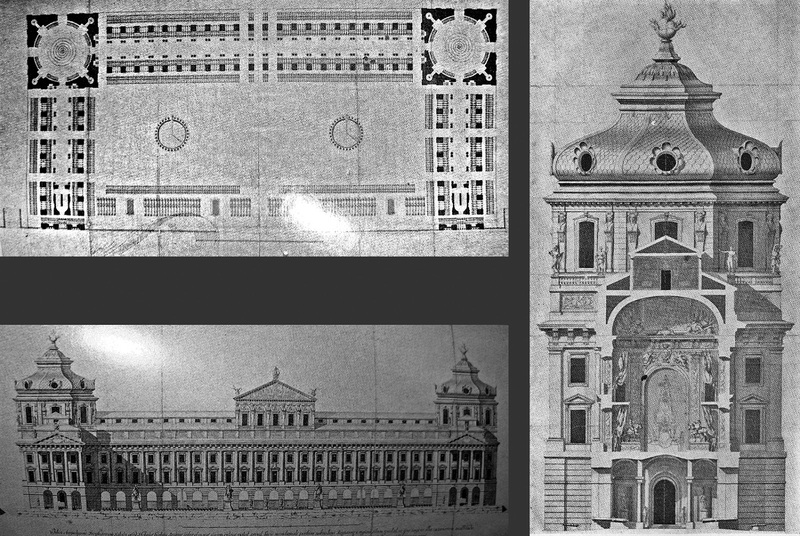 In keeping with the theme of tearing down or recladding everything in the vicinity that wasn’t designed by Tessin and that didn’t match his classical taste, Tessin proposed that the Mäkalös Palace (see #4 in my post Palaces of the 1600’s) (map 14) be torn down in order to make way for a monumental arsenal building. This new building would make a more fitting edge to Kungsträdgården than a private palace, and it would also house a public trophy room or victory hall so that the public could view the king’s war booty. Again, Tessin’s design goals seem to be more rooted in inflating the King’s ego than in reality. It’s hard to get a sense of the gigantic scale of this building from the drawing, but it is at least two city blocks long and the ceilings in the victory hall were 50 feet tall. Tessin provided lots of space for all the war booty that was highly unlikely to ever arrive. Again, the royal palace and Tessin’s palace were the only pieces of this grand scheme to ever get built. Due to the monarchy’s financial troubles, construction was delayed again and again, and by the time palace construction began in 1727, Tessin was on his deathbed. 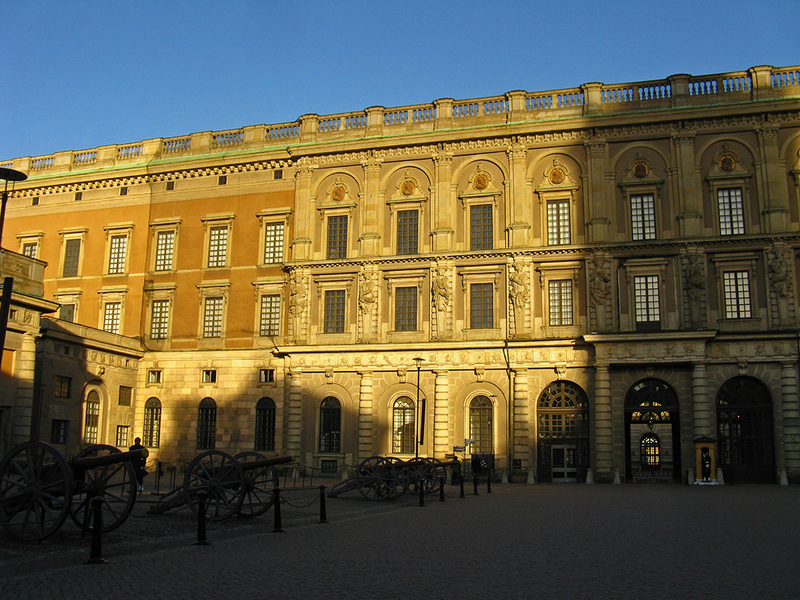 Architect Carl Hårleman took over the project and completed it according to Tessins plans and also designed the palace’s interiors. This explains why the palace’s exterior is a stricter, Baroque Classicism while the interiors reflect a later, richer French Rococo. My favorite part of the interior is the chapel and the droopy clouds everywhere. I suppose that the droopy clouds represent the Holy Spirit’s all-reaching presence, but they just make me smile. Just a sampling of the chapel's oozing, dripping, drooping clouds. The palace facades are currently undergoing a $36 million, 50 year renovation, which is why there is black netting and scaffolding visible in several of my exterior photos. Some of my favorite palace details. Left: This "wrapping" pedestal is on Tessin the Elder's north facade, but the detail is repeated on Tessin the Younger's facades as well. Middle: This is the "left over" space between the palace's northwest wing and the arcing wing. Right: Streetlamp and beautiful, crisp shadow. Tourist tip: You can walk into the chapel for free, and I highly recommend stopping in while you explore Gamla Stan. However, if your stay in Stockholm is short, I recommend going to Drottningholm Palace (also designed by Tessin) instead of touring this palace. The Drottningholm Palace tour is much more extensive, the interiors are much less disturbed, and the grounds with auxiliary buildings are greatly interesting.